Did you expect their life to be any different? Model Gisele Bündchen is married to one of NFL's biggest stars, New England Patriot's Quarterback, Tom Brady. They recently built a $20 million dollar home in the Brentwood section of Los Angeles. The 22,000 square foot home boasts eight bedrooms, a six-car garage, a lagoon-shaped swimming pool with spa, an elevator, a weight room, and a wine cellar. Do you expect anything less from this celebrity couple? Their new home is featured in October's issue of Architectural Digest. The home’s walls are a blend of three types of Texas limestone and is surrounded by a koi-stocked moat. Despite its size, the home looks cozy and comfortable and a great place for them to raise their children. The architecture is by Landry Design Group and Joan Behnke & Associates oversaw the interiors; the landscape design is by the late Dennis Hickok. Recently, there has been a trend towards light and bright interiors. Many of the kitchens you see in magazines, on tv, and around the internet typically feature white cabinets and marble countertops. Even our current kitchen renovation is going in a light and bright direction. This past weekend, I found myself watching an episode of Keeping Up With The Kardashians and fell in love with the dark, moody interiors in the Kardashian/Jenner home. 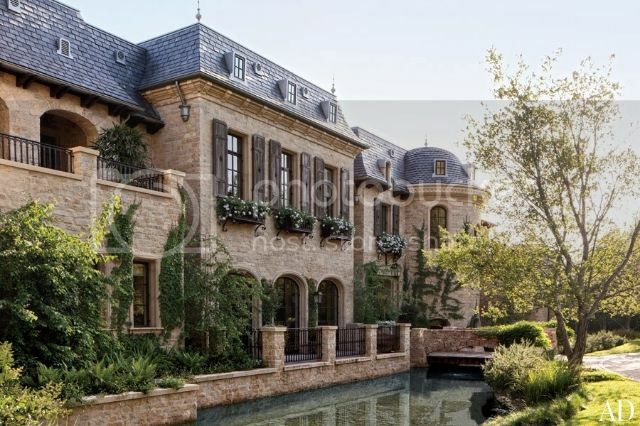 The interiors of the Kardashian/Jenner home in Hidden Hills, CA were designed by interior designer, Jeff Andrews of LA. I love the dark greys, blacks, browns, and golds that were used to create a moody, cozy, Hollywood Glam home. Even though you don't think "homey" and "cozy" when you look at the size of their home, I think the color palette makes the home feel more intimate.